Sage Dhoumya lived in his ashram or hermitage in the forest. He had three students- Aruni, Upmanyu, and Ved. Aruni lived in the ashram. One day Aruni was returning to the ashram after collecting firewood from the forest. It was a cold and windy day. It was raining heavily and the fields were full of water. While he was crossing the field, Aruni saw that at the far end, a barrier of earth had been built to stop water from entering the fields and destroying the crops. But to his dismay, there was a gap in the barrier and water was leaking through it. Aruni realised that if the leakage was not stopped immediately, the water would enter the fields and destroy the crops. He decided to rush to the ashram, leave the firewood there, and then come back and tried to put some mud and straw in the gap. But the pressure of the water was very strong and washed away the mud. Meanwhile, in the ashram, sage Dhoumya was worried that it was getting dark and Aruni had not returned. At night, along with the other students he set out to look for Aruni . As sage Dhoumya called Aruni's name, he heard a faint reply. 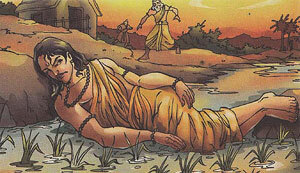 They reached the spot and found Aruni lying on the mound of earth to stop the water from leaking . He was shivering with cold. His teacher was very happy to see his act of devotion. Sage Dhoumya took Aruni back to the ashram and made him warm and comfortable. He declared that he would be famous for his act of devotion.